G.R.Y.B.B. 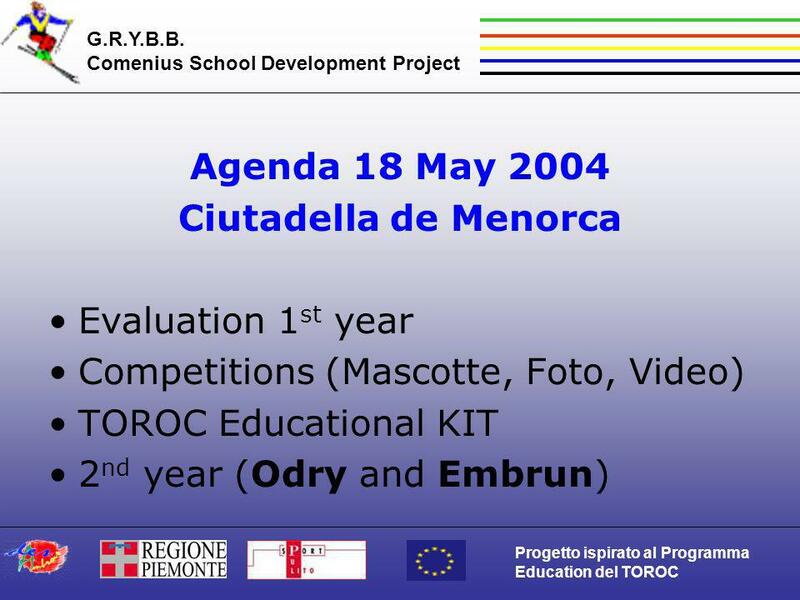 Comenius School Development Project Progetto ispirato al Programma Education del TOROC Agenda 18 May 2004 Ciutadella de Menorca Evaluation 1. 5 G.R.Y.B.B. 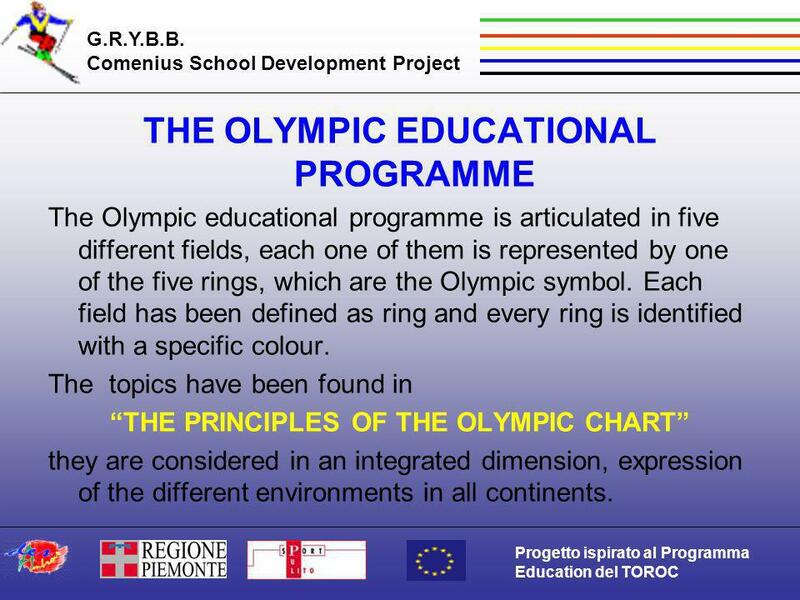 Comenius School Development Project Progetto ispirato al Programma Education del TOROC THE OLYMPIC EDUCATIONAL PROGRAMME The Olympic educational programme is articulated in five different fields, each one of them is represented by one of the five rings, which are the Olympic symbol. Each field has been defined as ring and every ring is identified with a specific colour. The topics have been found in THE PRINCIPLES OF THE OLYMPIC CHART they are considered in an integrated dimension, expression of the different environments in all continents. Download ppt "G.R.Y.B.B. 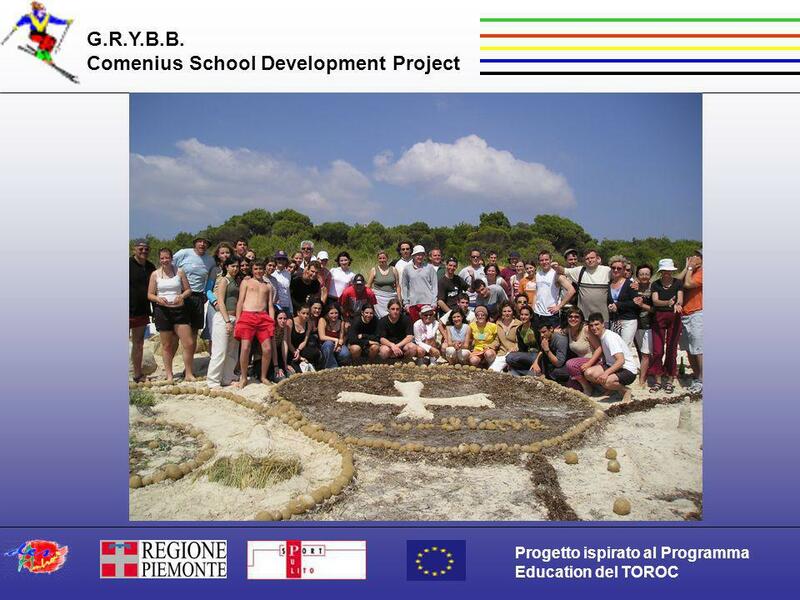 Comenius School Development Project Progetto ispirato al Programma Education del TOROC Agenda 18 May 2004 Ciutadella de Menorca Evaluation 1." Progetto ispirato al Programma Education del TOROC G.R.Y.B.B. Comenius School Development Project Health Education at Des Ambrois. 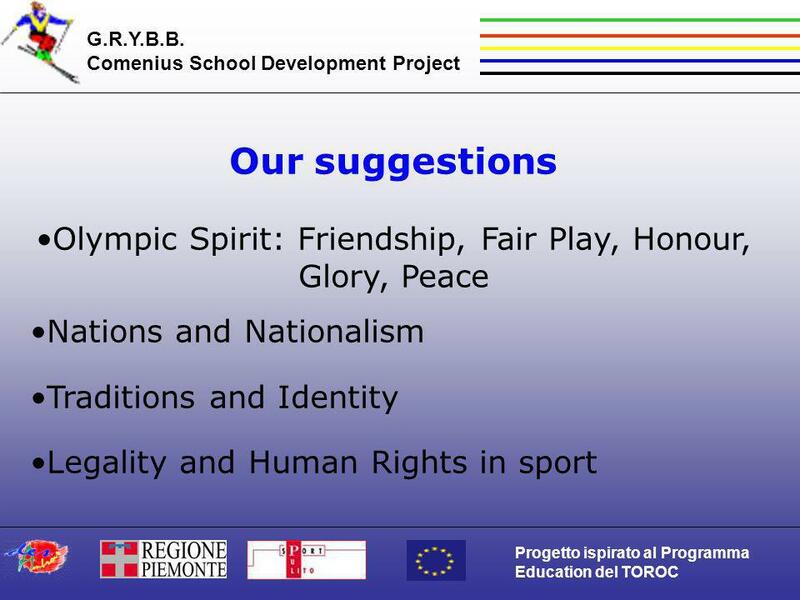 Progetto ispirato al Programma Education del TOROC G.R.Y.B.B. Comenius School Development Project The RED RING HOORN – HOLLAND 4-21 november 2005. Progetto ispirato al Programma Education del TOROC G.R.Y.B.B. 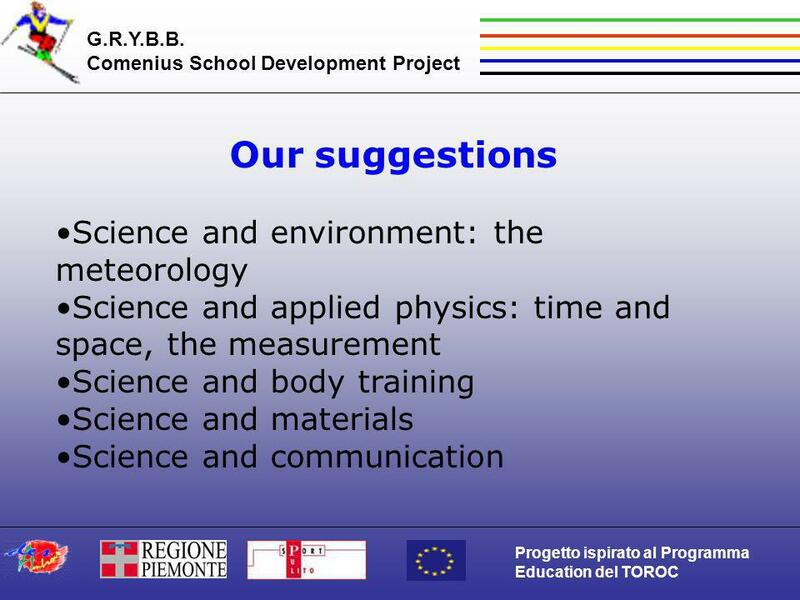 Comenius School Development Project Presentation projected for Power Point 2002 or higher. Progetto ispirato al Programma Education del TOROC G.R.Y.B.B. Comenius School Development Project TOO SLIM OR TOO FAT? THIS IS THE QUESTION. SOCRATES European Community Program in the field of EDUCATION Romanias experience in the SOCRATES program. 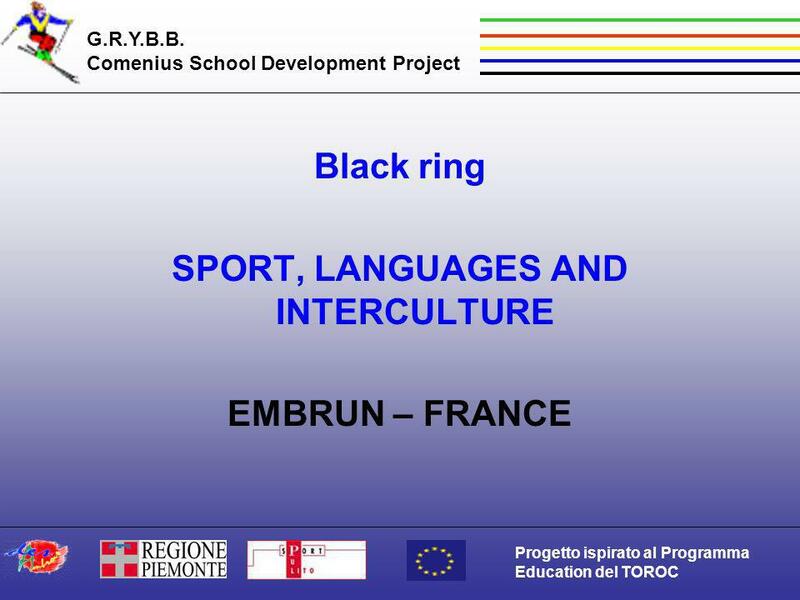 Progetto ispirato al Programma Education del TOROC G.R.Y.B.B. Comenius School Development Project. Welcome Welcome to Getting Results A National Science Foundation project developed by WGBH with the League for Innovation and 13 community colleges from. WE EUROPEANS 4 ο ΔΗΜΟΤΙΚΟ ΣΧΟΛΕΙΟ ΘΕΣΣΑΛΟΝΙΚΗΣ ΕΛΛΑΔΑ. I Mediterranei. Agenda  The story  Objectives of the “EU Team”  The Implementation  Malta experience  The working process, challenges and fun  The. Use this term to describe structures and relationships in society that appears to be based on male dominance and female oppression. Sport and physical. 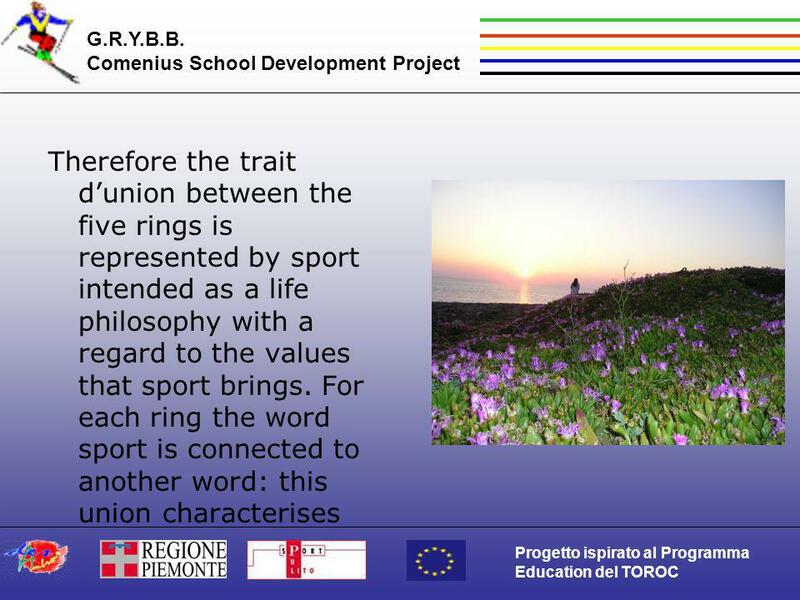 Progetto ispirato al Programma Education del TOROC G.R.Y.B.B. 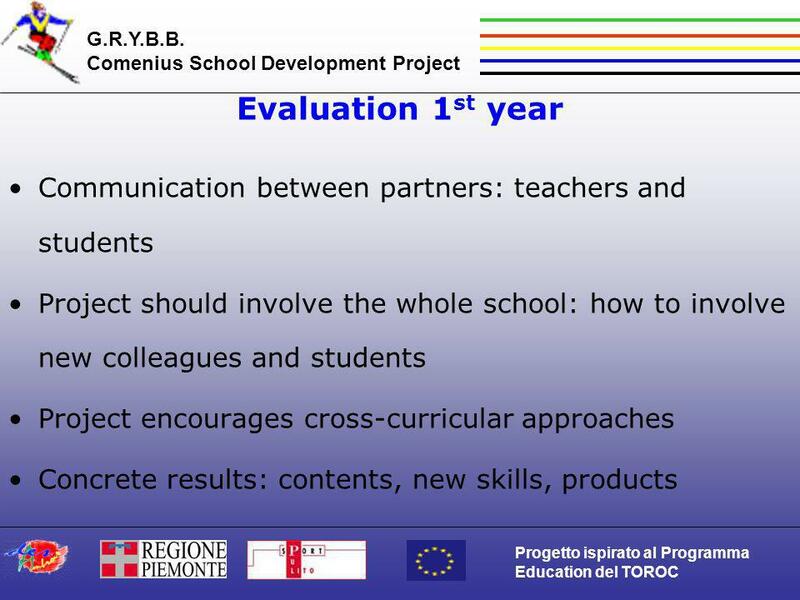 Comenius School Development Project E.Y.S.C. European Youth Sport Campus Oulx, march. Olympic games. Lots of people in the world are fond of sport, because it’s not only healthy, but also spectacular and exciting. For these reason people. What is the Olympics? The Olympics is a sporting event that takes place once every 4 years Participants come from all over the world to bring honour. The modern Olympic Games is the leading international sporting event with summer and winter sports games in which thousands of athletes participate in. 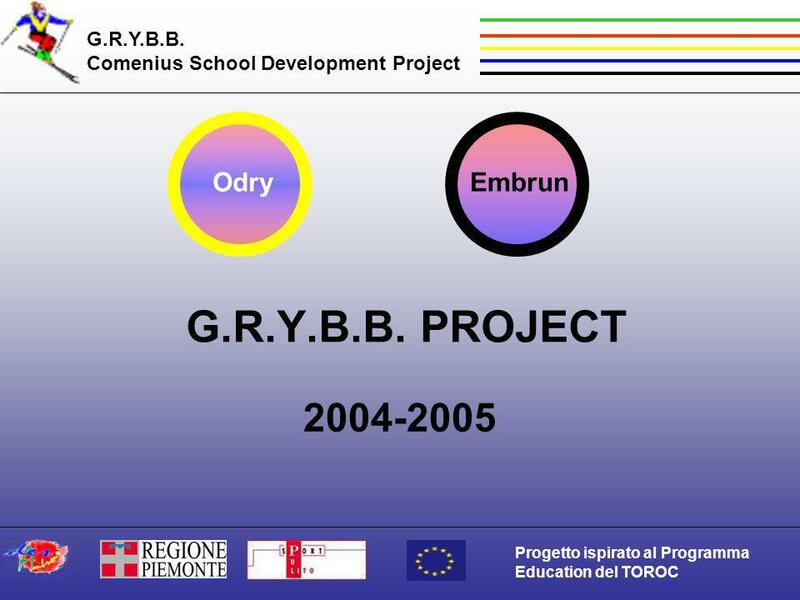 Progetto ispirato al Programma Education del TOROC G.R.Y.B.B. Comenius School Development Project The RED RING HOORN – HOLLAND 7-11 november 2005. Blocks to Robots Constructionist Approach to Project Based Learning for New STEM Teachers Author & Presenter: Michael Kutch New Teacher Orientation 2010.